If you use ShowMojo to automatically distribute weekly reports to your owners — or if you don’t but should — then we’ve got great news for you. Recent Showing Activity: A straightforward metrics shot that includes leads collected, showings scheduled, showings conducted and upcoming showings. Lead Funnel Analysis: A simple prospect conversion funnel, from leads to scheduled showings to actual showings. Lead Source: A detailed list of all lead sources. Prospect Feedback: A numeric rollup of showing feedback. You decide which data tables to include, and in what order. And you can update the template with additional details for your owners — wherever you like. 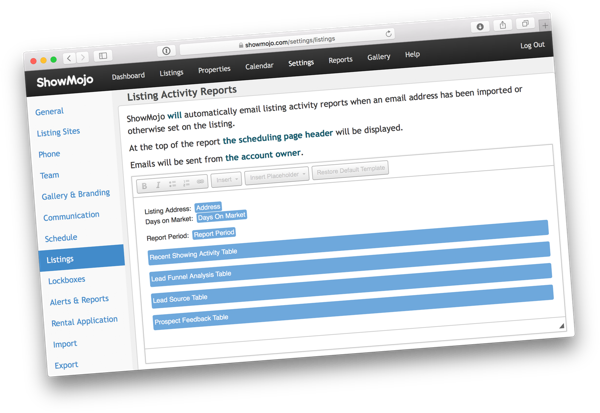 These Listing Activity Reports leverage the new templating system used by our Rental Application features. You can add links, bulleted lists, numbered lists and more. The new Listing Activity Reports are live as of two hours ago. If you already send weekly reports to your owners: all the new bits are already configured and ready to go. Technically, you don’t need to lift a finger. But if you want to add your own personal touch, just hop over to the Listings Settings page and scroll down to the Listing Activity Reports section. If you need to start sending weekly reports to your owners: just review our aptly-titled knowledge base article: Send Automated Weekly Listing Activity Reports to Owners.